On Wednesday night, I changed trains in Kansas City, from the short-run Missouri River Runner to the Southwest Chief, which runs Chicago to California. We were late upon arrival (about midnight) in Kansas City, but the Chief was held for us. Thankfully. Sleeping in a train coach is a real challenge, but still preferable to the hard benches in the Amtrak section of the magnificent (but not necessarily comfortable) Kansas City Union Station. On Thursday morning, I woke up to early light in the rolling plains of western Kansas and I parted the window curtains to start watching the passing sights. Grain elevators, dusty red roads, a man fixing a wheel, a German Shepherd lolling on cool concrete, water running full in an irrigation ditch. Then we were into the southeastern corner of Colorado, where the terrain changes again. We glided between low gray mesas dotted with scrub oak and mesquite. The sky was overcast with only occasional peeks of sunshine, so there weren't good views of the Rockies up around Colorado Springs. 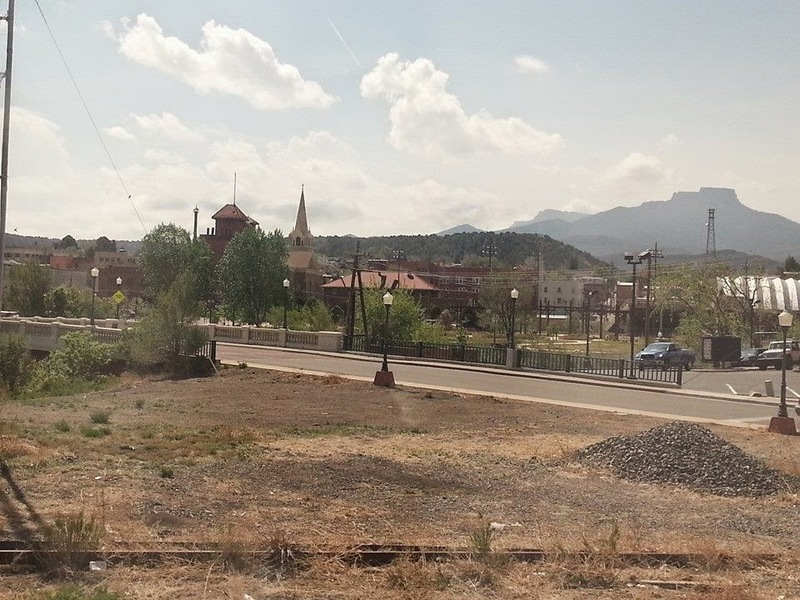 At Trinidad we turned south to enter New Mexico and witness the rugged beauty of the Sangre de Cristo Mountains. There were storms around us, with dark clouds and lightning off to the east, but only one small stretch where rain actually pelted the train. The scenery is spectacular around Raton Pass, but I have to admit I was napping and missed most of it this trip. A bout of respiratory illness has made this journey less enjoyable than usual. I just wanted to get off the stuffy train into some dry, clean New Mexico air. Sangre de Cristo Mountains, northern New Mexico. "Then we were in New Mexico and passed the rounded rocks of Raton," said Jack Kerouac in On the Road. There is plenty of rock around the small, charming town of Raton. The site was once a stop on the Sante Fe Trail and became known as Raton ("mouse" or "small rat") in 1880. The original 300+ acres of the town site were once part of the huge Maxwell Land Grant. 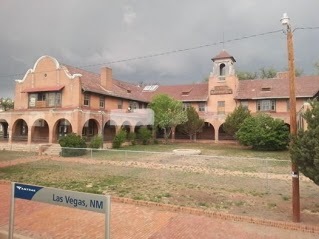 Las Vegas is one of my favorite cities in New Mexico, and its amazing and still-standing La Castaneda Hotel one of my all-time favorite buildings anywhere. La Castaneda was one of the larger Harvey Houses, and I just heard that it has been recently purchased. I'm hoping for great preservation and restoration news about it. Las Vegas was a real "Wild West" town. Wyatt Earp, Doc Holliday, Billy the Kid, and Jesse James were some of the more notable names known to have spent time there. The railroad boom in the late 1800s brought merchants, entrepreneurs, gamblers, and tramps tumbling off railroad cars in big numbers. Now it's a handful of sedate Amtrak travelers, but the look and the feel of the city is still authentic. Interestingly, as I checked Facebook during the afternoon, I found that Route 66 pal Rich Dinkela (from St. Louis) was in Las Vegas, New Mexico, eating pizza as I passed through taking photos from the train. Small world. La Castaneda Hotel, Las Vegas, New Mexico. Glorieta Pass is another beautiful and historic spot along the route down toward Albuquerque. Here in 1862 the Union Army achieved victory over the Confederates to turn the tide in the Civil War in the west. 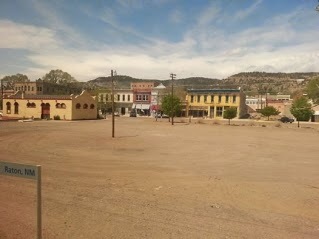 Finally, after a few more delays for track workers and signal problems, we reached Albuquerque, where my daughter waited to pick me up for several days of R&R with the New Mexico branch of my family. And no late-night train change.